Thing kicks off this week with a bang when long-running crossover thrash band D.R.I. bring their fury to Reggie's on Monday night; that night there's also a great free gig at Empty Bottle with local postpunk bands Population, Magical Beautiful, and Columbia Fasciata. On Tuesday the suburbs go metal when Red Fang and Big Business bare down on Berwyn's Wire on Tuesday night. There's also dance-punk band Moving Units at the Bottle and Josh Krajcik at City Winery. Check out a few more top picks from the first half of this busy week below. Yonatan Gat, who was the guitarist for Israeli band Monotonix, comes to town this week on a solo jaunt. Leor Galil says, "His new EP, Iberian Passage, is a stew of Brazilian psych, pan-African rock, explosive punk, and outre lo-fi indie. Gat leads you through his music’s many changes with guitar playing so wildly inventive and freewheeling that it sounds like he’s making it up as he goes the whole time. And when he dials down the avant-gardisms, his songs can be hypnotic—on 'Bordeo' he talk-sings over a tropical guitar melody that’s as tranquil as palm trees swaying in the breeze." "Metal trio Castle, whose members are split between San Francisco and Toronto, streamline their sound on their third full-length, the new Under Siege," write Monica Kendrick. "Its eight songs total only a little more than half an hour, and though they’re relatively short and sweet, they have a fiery density and epic feel that’s in keeping with the stunning cover by Russian occult artist Denis Forkas Kostromitin. It’s not as frenzied as 2012’s Blacklands sometimes gets; Castle seem to have decided to focus on the medieval-tavern-brawl elements of their sound, and they’ve done a great job." 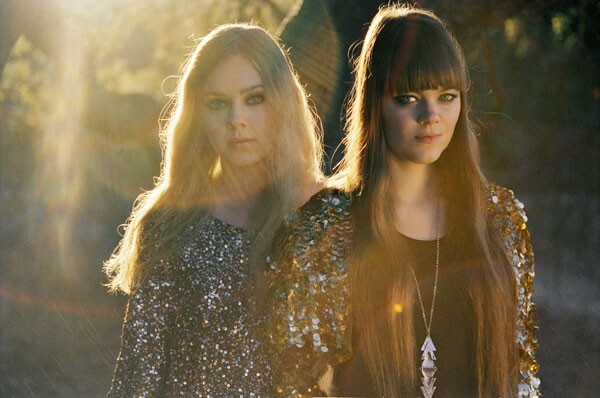 Sisters Klara and Johanna Söderberg are Swedish group First Aid Kit. Peter Margasak says, "the blend of their voices has been the most reliably appealing element of their music for three increasingly assured albums now. The brand-new Stay Gold, like its 2012 predecessor, The Lion’s Roar, was made in Omaha with producer Mike Mogis; arranger Nate Walcott surrounded the vocals with rolling strings, buoyant reeds, and warm smears of steel guitar."